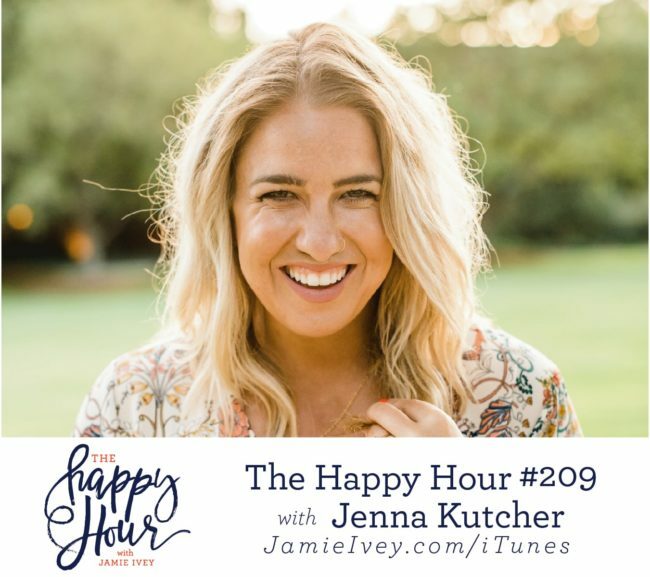 My guest for The Happy Hour # 209 is Jenna Kutcher. Jenna walked away from her corporate office job with nothing more than a camera from Craigslist, and turned that investment into a 7-figure photography and education business. Jenna also runs and hosts the Goal Digger Podcast, an authentic, business-focused show that caters towards women entrepreneurs. Her biggest passion is to invest in entrepreneurs so that they have the tools to authentically grow their businesses. On today's show Jenna shares with us how she bought a camera, claimed her new title of "wedding photographer", and pursued her dream to spend her time doing what her heart valued. Jenna dispels the myth that work and passions can't align, and encourages us to find what inspires and energizes us and go after it! If you don't follow Jenna on Instagram, you should. Jenna has beautiful pictures that aren't just a highlight reel, but walks through the ups, downs, and everything in between! Jenna tells us why she decided to post pictures that show her in real life and how she hopes to encourage women to embrace and love who they are, just as they are. In the last part of the show, Jenna opens up about her walk through infertility, miscarriages, and her current pregnancy. Jenna describes the anger she felt after the miscarriages and how she realized her need to surrender and trust God. I think we can all think of a situation where you "knew there was a bigger plan, but it's sometimes hard to believe" amidst the circumstances. I loved my conversation today with Jenna and her encouragement to pursue what we value, embrace who we are, and to surrender and trust God! Enter the The Happy Hour Book Club Contest - use #happyhourbookclub to show us how you're enjoying The Happy Hour Book Club and you'll be entered to win!